The other day I noticed an unsightly gap in the binding around the soundboard of a dulcimer I am currently working on. 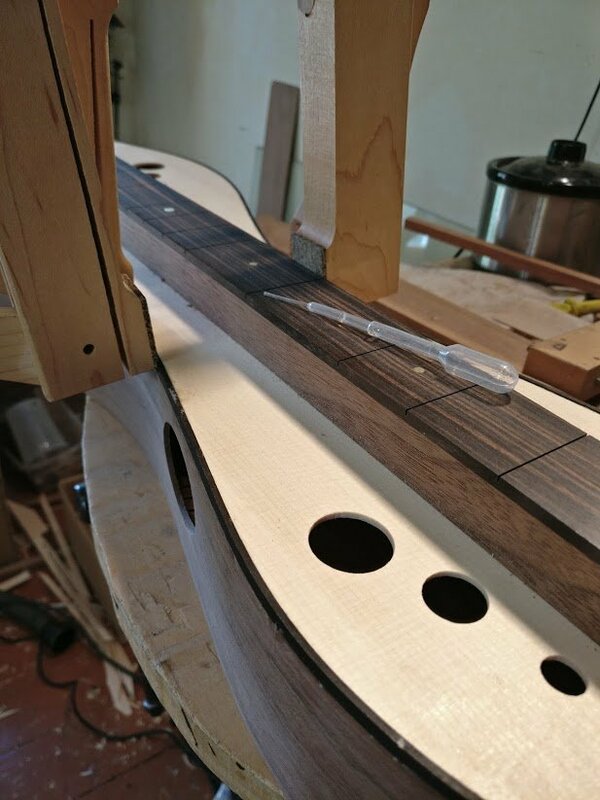 Small gaps are not uncommon when binding an instrument and there are several methods for filling them. This gap was large enough to cause me to consider removing the binding and starting again. The gap was about 2 inches long and barely open enough to catch a fingernail (my default tool for checking gaps) but I would not have slept well just filling it and calling the job done. No one would ever know but I would know I could and should have done better. Before replacing the binding on one side of the dulcimer I thought I’d try another method of repair. At best it might solve the problem, at worst I might aggravate the problem but I was going to replace the binding anyway. I ran hot water into the gap several times with a pipette to soften the glue and clamped the binding against the body to close the gap. After a few hours I took off the clamp and the gap was barely noticeable. The soundboard had swollen a little due to applying hot water so I let the repair dry over night. The next day most of the swelling had left the soundboard and after cleaning up the area with a scraper and file the gap was almost invisible. After applying a small amount of filler and a bit of spot sanding the gap was gone.